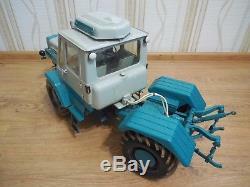 Vintage Soviet Russian Tractor T-150K. 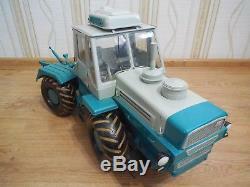 This model was made at the Kharkov tractor plant, where produce real tractors. This model you won't find anywhere else. This wonderful model will make a nice addition to your collection. I had many different models, but it's the best and my favorite model. 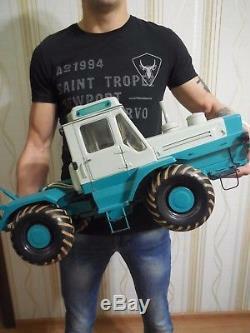 This magnificent model was manufactured in the early 80's at the Kharkov Tractor Plant for Volodymyr Vasylyovych Shcherbytsky - leader of the Soviet Communist Party of Ukraine. He was a leader of the Soviet Communist Party of Ukraine from 1972 to 1989. During World War II, he participated in the invasion of Iran by the Soviet forces (Iran crisis of 1946). 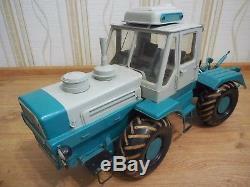 T-150K is an agricultural energy-saturated wheeled tractor of general purpose, produced by Kharkov Tractor Plant named after Sergo Ordzhonikidze. At the same time, the agricultural, energy-saturated caterpillar tractor of general purpose T-150 is maximally unified with it. They differ in running systems, turning mechanisms, frames, gearboxes (unified by elements) and control systems. The creation of a family of wheeled and caterpillar tractors unified among themselves proved to be a very difficult task. Now along this path follows the famous firm John Deere (for example, John Deere 8120 and John Deere 8120T). 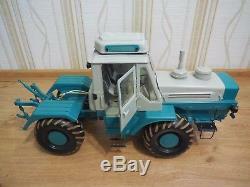 Historically, the wheel variant (T-150K) of the tractor was made earlier and got much more widespread. The T-150K tractor is a modernization of the T-125 tractor, the design of which is completely original and has no predecessors. 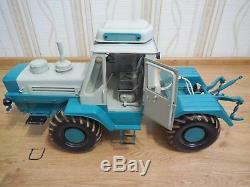 In 1979, the T-150K tractor was successfully tested at the international test site of the University of Nebraska, USA. 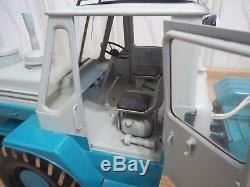 The T-150K tractor has been produced for more than forty years, several upgrades have taken place, the technical specifications given in the article refer to 1975. This model you won't find anywhere else, the second such does not exist! 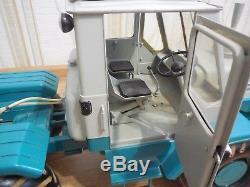 Details of attachments and driver's seat, spring-loaded and moving. The front and rear frame halves are movable with respect to the vertical hinge. 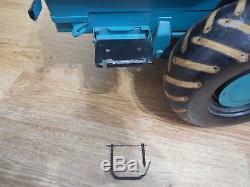 The footboard is broken off on the left side (see photo), but you can easily glue it. Material: the body is made entirely of metal, the wheels are made of wood, the windows are made of transparent film. The length of the model: 59 centimeters. The width of the model. The height of the model. Approximate weight: 7.5 kg. See photos for additional details. I guarantee the authenticity of every item I sell. 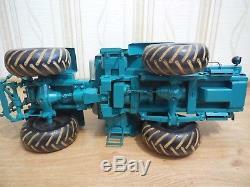 Please take a look at my other interesting old items. Feel free to ask any questions and you're welcome to make me an offer! 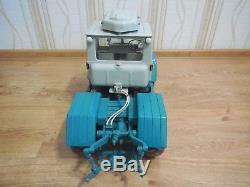 The item "Vintage Soviet Russian Tractor T-150K Big Metal Model Scale 110 USSR LOOK! WOW" is in sale since Saturday, October 14, 2017. 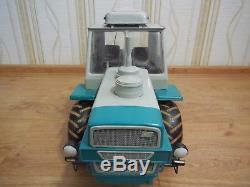 This item is in the category "Toys & Hobbies\Diecast & Toy Vehicles\Farm Vehicles\Vintage Manufacture". The seller is "piramidin-ua" and is located in Europe. This item can be shipped worldwide.